Beautiful spacious and very light, fully furnished apartment located in a TOP location in the middle of the bustling center of 's-Hertogenbosch with a fantastic view of the Sint-Jans basilica; a unique location! This sublime home has a high quality finish, is spacious and has all modern comfort. The complex (listed building) has been modernized fairly recently and has a sleek look and lift. The apartment is on the corner of the building and has several large sliding windows on both sides and is also equipped with high ceilings, a fully equipped open kitchen in a spacious living room, separate bedroom, neat bathroom with bath and shower and separate toilet. 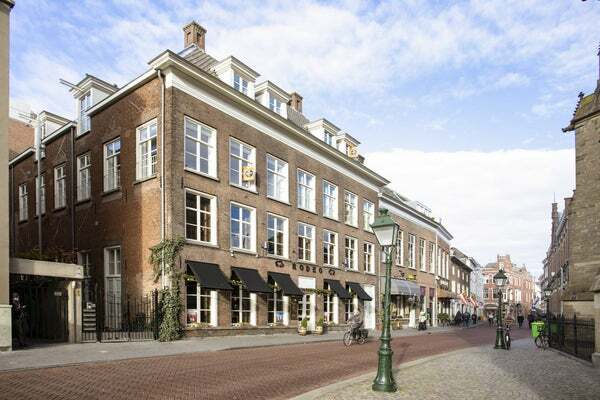 In the vicinity you will find all the amenities that 's-Hertogenbosch is known for, such as the Parade, the Bossche Markt, various nice shops and restaurants. Parking is possible nearby in two parking garages (Wolvenhoek / Sint Josephstraat). The property is offered fully furnished; ideal for an expat! Layout; Through the gate on the Torenstraat you reach the main entrance on the side of the building. You reach the second floor through a staircase on the elevator. Through a long corridor with toilet with hand basin, you reach the spacious living room with various large windows and open kitchen. The kitchen is equipped with all modern comforts such as dishwasher, gas hob, fridge etc. Through sliding doors with bookcase you reach the bedroom on the side of the building. From here you have access to the tiled bathroom with bath, shower and sink. A washing machine and dryer can be found neatly concealed in a storage cupboard accessible from the living room. In short, a top property in the best location in the city center! Rent fully furnished and with service costs euro 1,495.- excl. G / W / L.
Deposit 2 months rent. Available immediately! Rental period at least 12 months, shorter periods in consultation. Contact the real estate agent for more information or your viewing.